White Clay Creek is protected by the United States Federal Government as a result of its designation under the Wild and Scenic Rivers System by the National Park Service. Working together to protect and preserve the creek are White Clay Creek State Park, located in Delaware’s New Castle County, and White Clay Creek Preserve, located in Pennsylvania’s Chester County. A large portion of the 4,555 acres that make up both state parks was donated by the DuPont company, who had purchased it with plans to build a new reservoir. When this plan was protested and the companies water supply issues were solved, they were persuaded to donate the large amount of land that they had acquired. The Delaware state park was established in 1968 and the protected area in Pennsylvania was established in 1984. While these sections of the White Clay Watershed are protected, other nearby locations are commercially, residentially, and agriculturally developed. The University of Delaware Water Resources Center (UDWRC) saw it necessary to sample other Delaware waterways, including White Clay Creek, where turbidity levels have been rising as a result of nonpoint source pollution. 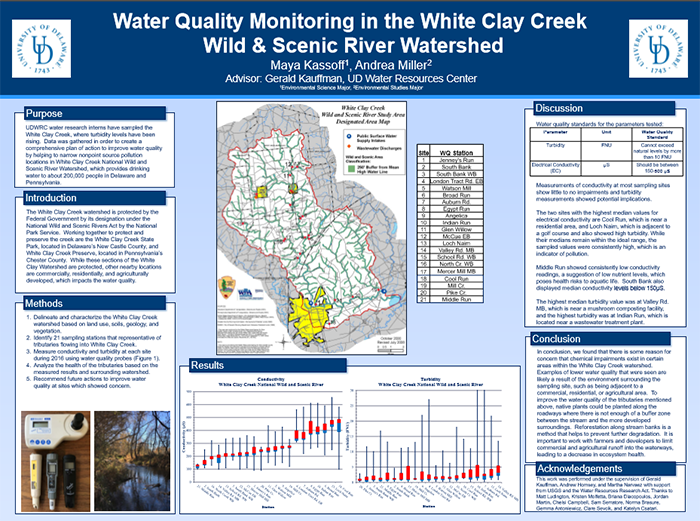 The WRC recognized this using gages provided by the United States Geological Survey (USGS) which retrieve water quality data for the main branches of White Clay Creek. Sampling sites within the White Clay Watershed in both Delaware and Pennsylvania were chosen in January of 2015 by undergraduate researchers based on location of flow into the creek. Twenty-one testing sites on each branch of White Clay Creek throughout the watershed were chosen. In order to create a comprehensive plan of action to improve water quality in White Clay Watershed, data was gathered from the tributaries. Water quality sampling, which was done by student research assistants and interns from the UDWRC, took place from in 2016 from February through December. The students took measurements for both turbidity and conductivity. The purpose of monitoring the water quality at these sites is to help narrow nonpoint source pollution locations which contribute to high turbidity levels. By determining the areas with the highest turbidity, they can be prioritized for funding and restoration efforts. We hope that this research can aid in improving the water quality of White Clay Creek and its tributaries.